Edwin Sydney Stuart Lewis Emery, Jr. 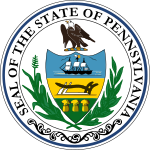 The Pennsylvania gubernatorial election of 1906 occurred on November 6, 1906. Incumbent Republican governor Samuel W. Pennypacker was not a candidate for re-election. Republican candidate Edwin Sydney Stuart defeated Democratic candidate Lewis Emery, Jr. to become Governor of Pennsylvania. ^ "PA Governor General Election". OurCampaigns. Retrieved 5 July 2012.